The Chicago Freedom Movement, also known as the Chicago open housing movement, was led by Martin Luther King Jr., James Bevel and Al Raby. The movement included a large rally, marches, and demands to the City of Chicago. These specific demands covered a wide range of areas besides open housing, and included quality education, transportation and job access, income and employment, health, wealth generation, crime and the criminal justice system, community development, tenants rights, and quality of life. The Chicago Freedom Movement was the most ambitious civil rights campaign in the North of the United States, lasted from mid-1965 to early 1967, and is largely credited with inspiring the 1968 Fair Housing Act. The Chicago Freedom Movement represented the alliance of the Southern Christian Leadership Conference (SCLC), the American Friends Service Committee (AFSC), and the Coordinating Council of Community Organizations (CCCO). In 1965 SCLC was looking for a site to prove that nonviolence and nonviolent direct action could bring about social change outside of the South. Since 1962, the CCCO had harnessed anger over racial inequality, especially in the public schools, in the city of Chicago to build the most sustained local civil rights movement in the North. The activism of the CCCO pulled SCLC to Chicago, as did the work of the AFSC's Kale Williams, Bernard Lafayette, David Jehnsen and others, owing to the decision by SCLC's Director of Direct Action, James Bevel, to come to Chicago to work with the AFSC project on the city's West Side. The Chicago Freedom Movement declared its intention to end slums in the city. It organized tenants' unions, assumed control of a slum tenement, founded action groups like Operation Breadbasket, and rallied black and white Chicagoans to support its goals. In the early summer of 1966, it and Bevel focused their attention on housing discrimination, an issue Bevel attributed to the work and idea of AFSC activist Bill Moyer. A large rally was held by Martin Luther King at Soldier Field on July 10, 1966. 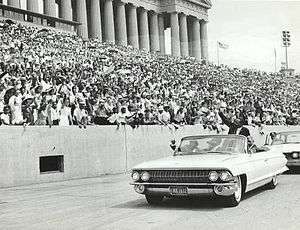 According to a UPI news story that ran the next day, "About 35,000 persons jammed Chicago's Soldier Field for Dr. King's first giant 'freedom rally' since bringing his civil rights organizing tactics to the city.…" Other guests included Mahalia Jackson, Stevie Wonder, and Peter, Paul and Mary. By late July the Chicago Freedom Movement was staging regular rallies outside of Real Estate offices and marches into all-white neighborhoods on the city's southwest and northwest sides. The hostile and sometimes violent response of local whites, and the determination of civil rights activists to continue to crusade for an open housing law, alarmed City Hall and attracted the attention of the national press. During one demonstration King said that even in Alabama and Mississippi he had not encountered mobs as hostile to Blacks' civil rights as those in Chicago. In mid-August, high-level negotiations began between city leaders, movement activists, and representatives of the Chicago Real Estate Board. On August 26, after the Chicago Freedom Movement had declared that it would march into Cicero, site of a fierce race riot in 1951, an agreement, consisting of positive steps to open up housing opportunities in metropolitan Chicago, was reached. The Summit Agreement was the culmination of months of organizing and direct action. It did not, however, satisfy all activists, some of whom, in early September 1966, marched on Cicero over the objection of James Bevel, who had directed the movement for SCLC. After the open-housing marches and Summit agreements, the overall Chicago Freedom Movement lost much of its focus and momentum when, by early 1967, Martin Luther King, James Bevel, and SCLC had trained their energies on other projects, mainly – for King and Bevel – the anti-Vietnam war movement. The 1968 Fair Housing Act was passed by Congress as a direct result of both the 1966 Chicago open housing movement and as a response to the assassination of King. The dark mystery that detective V. I. Warshawski unveils in the 2009 novel Hardball by Sara Paretsky is directly related to the Chicago Freedom Movement (and to racist violence against that movement). In the preface Paretsky recounts that she was at the time a student in the University of Chicago and that her deep support for the movement had a key role in her decision to stay permanently in Chicago and not go back to her native Kansas. ↑ "Eyes on the Prize: America's Civil Rights Movement 1954–1985". PBS Online / WGBH. Retrieved November 29, 2010. 1 2 Kotz, Nick (2005). "14. Another Martyr". Judgment days : Lyndon Baines Johnson, Martin Luther King, Jr., and the laws that changed America. Boston: Houghton Mifflin. p. 417. ISBN 0-618-08825-3. ↑ "Dr. King Urges Unity With Non-violence". Pittsburgh Press. July 11, 1966. Retrieved November 29, 2010. ↑ Associated Press (August 24, 1966). "Whites Stone Marchers in Suburb of Chicago". Miami News. Retrieved November 29, 2010. ↑ "King Makes Housing Agreement". Lodi News-Sentinel. August 27, 1966. Retrieved November 27, 2010. ↑ United Press International (September 3, 1966). "Guard Called Out in Cicero March". Sarasota Herald-Tribune. Retrieved November 29, 2010. ↑ "Dr. Kings Demands of the City of Chicago (1966)". Center for Urban Research and Learning, Loyola University Chicago. July 23, 2006. Retrieved November 29, 2010. Branch, Taylor (2007). At Canaan's Edge: America in the King Years, 1965–68. New York: Simon and Schuster. ISBN 9781416558712. Danns, Dionne (2003). Something Better for Our Children: Black Organizing in Chicago Public Schools, 1963–1971. New York: Routledge. ISBN 9780415935753. Danns, Dionne (2014). Desegregating Chicago's Public Schools: Policy Implementation, Politics, and Protest, 1965–1985. New York: Palgrave Macmillan. ISBN 9781137357588. Helgeson, Jeffrey (2014). Crucibles of Black Empowerment: Chicago's Neighborhood Politics from the New Deal to Harold Washington. University of Chicago Press. ISBN 9780226130729. McKersie, Robert B. (2013). A Decisive Decade: An Insider's View of the Chicago Civil Rights Movement during the 1960s. Carbondale, Illinois: Southern Illinois University Press. ISBN 9780809332458. Pacyga, Dominic A. (2009). Chicago: A Biography. University of Chicago Press. ISBN 9780226644325.